“I am always taken by surprise when a story line somehow finds its way into my consciousness and, once settled there, demands to be written. Then I'm stuck with it, whether I like it or not. And, unfortunately, those story ideas don't come equipped with a well thought-out plot; instead, you get this rather fuzzy but nagging image that won't go away until the story is fully developed. This is what happened to me with The Evelyn Project. Evelyn's studio portrait, which I used in the book cover, hangs on the wall beside my writing desk. My second daughter, Lilach, is her living image and her 26th birthday is approaching fast. That might have been a catalyst for me to write the book, although the sad story of Evelyn's death was always a part of my family's ethos; I must've sucked it in with my milk because I can't remember the first time her name was mentioned. When my parents died I was left with the responsibility to make sure that my family history would not be forgotten. That entailed a lot of reading in books, documents and letters, which brought Evelyn's figure increasingly to life for me. I learned of her warm relation with her father through letters she had written to him, and I discovered more than I already knew about my great-grandfather's devotion to her. Having got emotionally involved in her story I realized that I had to do more than just sit there and shake my head in sorrow. I couldn't just let Evelyn fade away in those yellowing papers. I had to do right by her (whatever that meant). My investigation of Evelyn's misfortune allowed me to put myself in my great-grandfather's shoes, to feel the emotions that he must have felt (he was approximately my age when Evelyn died) and to test the length to which a father would go in an attempt, no matter how futile, to save his child. I don't believe in stereotyping ghosts, so I won't say that I recognize Evelyn's hand or my great-grandfather's stick behind my urge to write the story. It is true, however, that now I feel much closer to them than I did before; they have assumed characters and a presence so real that at times it feels as if we had actually met. I often wondered whether they would have grudged me the use I made of their characters in a commercial book, but something tells me that if they can see us they understand that this is my way to give Evelyn some of the life she has been denied, even if only on paper. But this is not only about Evelyn. My great-grandfather was no less of a victim to her disease than she was. 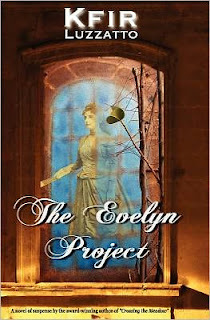 The Evelyn Project is my tribute to them both. Kfir Luzzatto was born and raised in Italy, and moved to Israel as a teenager. He acquired the love for the English language from his father, a former U.S. soldier, a voracious reader and a prolific writer. 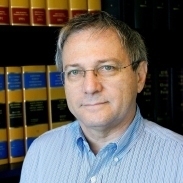 Kfir has a PhD in chemical engineering and works as a patent attorney. You can find Kfir Luzzatto on Twitter and on Facebook by clicking on the words! Evelyn's father did everything in his power to save his dying daughter, black magic included. But when a century later his plea for help gets into the wrong hands, all hell breaks loose. Caught in the slippery battlefield between the Vatican and a cult that wants to change the past, a young Italian professor and a beautiful French actress are too busy running away from murder and conspiracy to let physical attraction develop into love. And it further complicates things when Her Majesty's Secret Service decides to take an interest in what everyone else is doing to pull some strings of its own. Love that lasts through the veils of time, a mystery, and a race to end a conspiracy, "The Evelyn Project" is a story that will stir both your heart and your intellect. I will have a review on this book towards the end of August! Watch for it!! Defintely an interesting article and intro to the book. I look forward to reading your review. Great post, Laurie! Do you have any ghostly ancestors in your family? LOL I loved this book and hope others will, too.